I’ve probably mentioned it before but we’re HUGE fans of Jamie Oliver. After cooking with fennel for the first time a few weeks ago, I thought it might be nice to give it another go this week for our meatless venture. 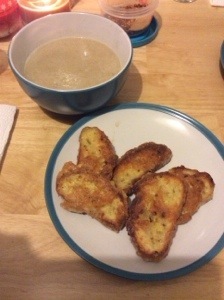 In Save with Jamie (our new obsession) there’s a brilliant recipe for Fennel Soup with French Toast Croutons. It wasn’t a bad meal, but not my fave so far. I just felt hungry afterwards and didn’t feel uber-satisfied by the soup. The cheesy french toast crouton thingies though were absolute winners though and I’d sooooo do those again any night. So far so good though, and I haven’t really had any cravings (other than chocolate) or hankered after any meat yet.